Last month, I shared why becoming a values-based culture is good for business. But knowing something is the right thing to do and accomplishing it are two different steps. Once an organization realizes they want to focus on building and cultivating a values-based culture, they need to put an action plan in place to accomplish the goal. Take a pulse on where the organization stands today. A tried and true assessment model is the SWOT analysis. SWOT represents strengths, weaknesses, opportunities and threats. Put everything learning-related on the table for discussion. Talk about content, administration, processes, etc. Once the assessment is completed, then have a conversation about where the organization would like to be in the future. It could make sense to also define short-term as well as long-term goals. Remember the goals being discusses and agreed upon should align with the organizational values that have been established. Specific: What is the goal we’re trying to accomplish? Measurable: How will we know when we’ve achieved the goal? Actionable: What are the individual steps that will help us accomplish the goal? Responsible: Who is responsible for each step in the process? Time-bound: When will each step be completed? The single most important step in developing and implementing a strategy is communication. Everyone involved in the strategy needs to feel their input was heard, understand the strategy and buy-into the strategy. Please notice I didn’t say everyone needs to get their way. When a strategy is developed using the right process, people will embrace and engage, even if the outcome wasn’t what they expected. Where communication is the most important step, implementation is the most visible. Everything that’s been done to date – all the planning, discussing, etc. – will be in full view. If the organization has a very aggressive strategy, consider implementing it in phases or creating a pilot group to test activities before they are rolled out to the entire organization. Last but certainly not least, monitor the strategy and evaluate its effectiveness. Make adjustments as necessary. The business world moves too quickly. If one of the original assumptions changes, make an adjustment. That’s not admitting failure. That’s a sign of being adaptable. This strategy can be used on an organizational level, department level or even an individual level. It could be incorporated into the annual performance review process. Ask employees to do a self-assessment before the performance review meeting. During the meeting, discuss and agree upon goals. The employee can develop a SMART plan that will serve as their professional development plan. The manager and employee will meet regularly to evaluate progress and discuss performance. Developing a values-based strategy is a key ingredient to creating a values-based culture. Maintaining a values-based culture is essential to organizational results. 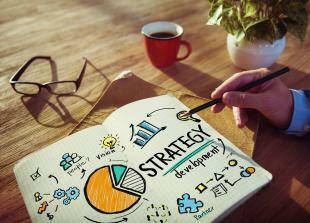 Our final post in this series will focus on keeping the strategy alive within the organization.